Welcome to my official campaign website for Bedford County Commissioner. When I ran for County Commissioner, I stood on the foundation of bringing honor, transparency, and sound moral principles to this office. I listen; I place the needs of our citizens above my own. I make myself available to the community, and I work with both individuals and organizations to help move Bedford forward in our goals, and in a positive direction. I have donated thousands of volunteer hours of my time as yet another way of giving back to my country and to the county I deeply believe in and hold in my heart. I knew that I wanted to live a life of public service while serving in the military in Afghanistan in 2007. When I returned from serving my country, I witnessed the struggles that many veterans were facing. Seeing the multitude of issues veterans endured drew my political path where I believed I could make a difference—having led that life as a soldier. My vision for Bedford County’s future is to be a place that is attractive to businesses and fosters entrepreneurial growth. As a County, we need to continue to coordinate and collaborate to help attract young people and be a place where families want to reside. As a Commissioner, I envision keeping taxes low, while maintaining a balance of investment to help move Bedford County forward in a positive direction. I hope for your continued support and encourage you to check out the other pages on my website to learn more about how you can join me in continuing to move Bedford County forward in a positive direction. Please remember to vote on May 21st. Josh Lang and his campaign team hit the ground running in March with re-election activities getting into full swing, and really getting into the action this month! 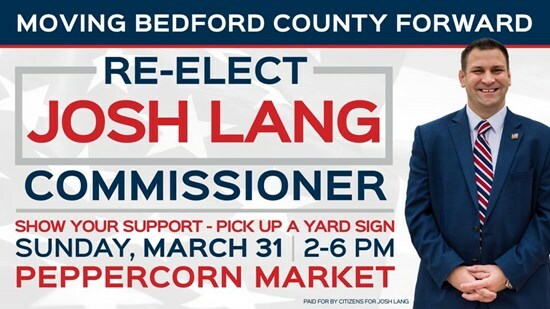 Why have gnomes or pink flamingos on your lawn when you can show support for Josh Lang as Bedford County Commissioner with a patriotic yard sign? Click here to find out how to get your red, white, & blue sign to display! What do peaches and petitions have in common? Join Josh on Saturday April 13th for one of his final events. You will have a fun filled evening with trivia, a great meal, and door prizes. Visit https://www.joshlang.net/fundraiser to RSVP today!